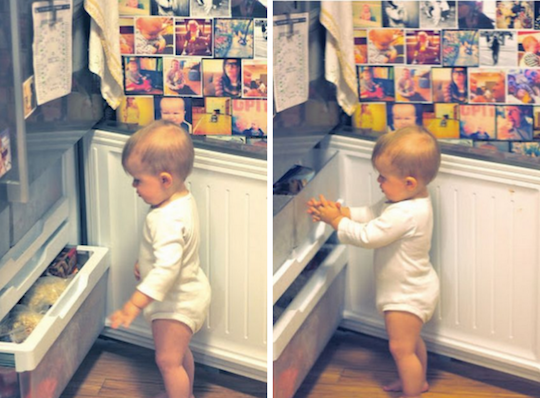 attempting to bust into mama's secret chocolate stash in the freezer. this little boy is starting to live up to his nickname's namesake. mischief, mischief, mischief. it is fun having a little boy around this house. p.s. the beso giveaway winner was announced HERE! I love that he runs around in onesies. It's so stinking cute. Happy Weekend! The Uchtdorf flower thing just made my day. Also, I first discovered your blog when you posted "Happiness is a baby in a white onesie" (those are my favorite pictures of Huck, and also the one where his crib was in the closet and just his round, chubby face is showing out of it) and he is still rocking those white onesies. Good gravy, that huckleberry is cute! Love your picture wall! Have a great weekend! his sandwich-holding obsession is still my favorite. Huck in his white onesie! There is nothing more perfect - they are so underrated! Have a great (funk-less) weekend! buck looks adorable in his habitat. those socks are very becoming of him! Huck is just too cute!!! And where did you get your couch? I love it! @jessica, our couch is from macy's. i think it's still available! i also just ordered the same couch. i have been looking for awhile and as SOON as i saw the photo of huck and the couch i knew. i knew it was the one. THANK YOU both. i am so excited for this beautiful little couch to be in my home! Bahahaha!! Prez. Uchtdorf is totally my apostle crush! And his accent! ooooh mama! nice nickname! love it:) oh, how i adore general conference! oh gosh, uchtdorf is definitely my favorite. his stories are just so relatable for everyone. Thank you for making it ok to have an apostle crush on Pres Uchtdorf. BECAUSE I TOTALLY DO. I would like to see something like this online. How do I view that on my computer?? "the silver fox"! I love it! It's do true! The males in my family have asked the gals in my family to stop telling them how attractive Dieter is. So excited for tomorrow morning! I just need to admit. I have spent the last 3 days stalking your blog. (in a non creepy way, i swear) I just discovered it and had to look through all your post, all the way to the first one. First I flipped through looking at the pictures, your post are long and a bit intimidating. BUT as soon as I actually read one I was hooked! You explain things so thoroughly that I feel like I lived it. Thats what makes your blog so great, that and your adorable little boy! Seriously, so cute! After reading your funk post, I just had to leave a comment. The fact that you keep blogging shows just how strong a person you are and how much courage you have. No matter what people on the internet say just know that they dont matter. The only ones that matter are the ones you hold close to you, your family. You have a great blog. Your style is amazing. Your little family is adorable. Your stories are personal and thats what makes people keep coming back to read each new post. Yay for conference weekend! We only get two of these weekends, fun memories for all of us. Huck so darling! That Uchtdorf meme! Oh dear. Reading your blog makes my day. It's so cute to see how much he loves Mickey mouse! My son is that way with Elmo and Miffy.I have to refrain from buying him a bunch of Elmo things because I know he likes them. 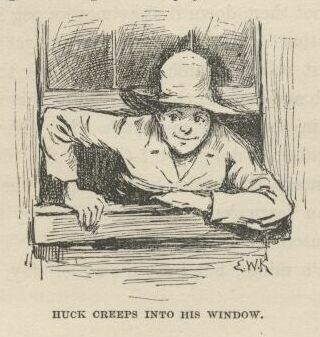 Gosh anytime you write about Huck I just get all mooshy gooshy excited to have a Baby and this does NOT happen. I'm actually afraid to have a baby but you really make we want to be a mom. I love you pictures! I was just wondering how you got the two vertical pictures to to be evenly spaced and in one row. I didn't know if you had to do it in photoshop. I've seen it on a couple of blogs, and I wanted to be able to do it on mine! Thanks! I am glad I am not alone on my Pres. Uchtdorf crush. He is so handsome! I want my hubby to age that well. This makes me so excited for our little boy due in July! I always feel sad when General Conference is over too...it was so good. Love that Huck is becoming michievous--just like a little boy should be. The Silver Fox...oh, that is just too funny! Love it! oh there is nothing sweeter than a baby in a onesie.